The core drills you use to push your projects forward can't work alone. These drill stands provide the stable bases your excavation tools require to deliver consistent results. The support hardware that holds your drill motors is no less essential than the diamond heads, motor assemblies, hydraulic systems and electronics that keep you breaking new ground. Browse our core drill stand listings to find replacements for worn fittings, stress-twisted members and even mount complete assemblies. Working in an unconventional environment? Never fear, because our Milwaukee core drill stand packages come with your choice of mounting option. Whether you choose a simple base stand, a more advanced vacuum hold-down unit or something with a complete anchor mechanism, the U.S. Diamond selection makes it easy to find tools that fit the task. Looking for something less extensive? 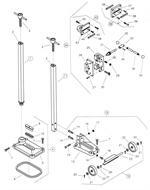 Check out our mount, electrical, wheel assembly, base assembly and other parts categories. We understand that maintenance is critical, so we're ready to help you complete your upkeep work with a range of quality components. Browse the listings below to get started, and keep your core drills drilling. 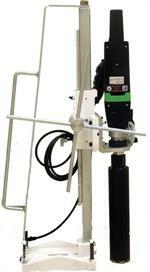 Drill Stands for use with Hand Held Core Drilling Motors. Use for Drilling larger diameter Holes or increased production. Standard Length or Special Length Columns for restricted clearance or deep hole drilling.